Affectionately known as Daaji, is the fourth spiritual guide in the Sahaj Marg system of meditation, facilitating Heartfulness Meditation worldwide. In the last post, we discussed the importance of healthy sleep cycles. There are also other natural daily cycles in the human body that we can easily observe. Being in tune with Nature is an important part of wellness and all-round good health -- physical, mental and spiritual. So here we explore a cycle that guides us on the best times during the day to meditate, do physical activity, mental activity and rest. If you watch your breath you will find that it is usually flowing more in one nostril than the other. Check and see which one of your nostrils is breathing dominantly at this moment? 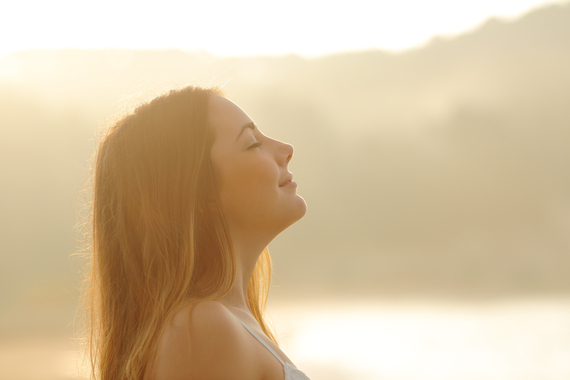 In the ancient yogic shastras, great significance was given to observing the breathing. The right nostril was associated with the Surya Nadi [Sun current] and is also called Pingala. The left nostril was associated with the Chandra Nadi [Moon current] and is also called Ida. Nadi means 'flow or current'. In the ancient texts it is written that there are thousands of nadis in the psychic body of a human being. Like chakras, they are not located in the physical body, though the nerves of the physical body are their corresponding physical manifestations. The meridians of Chinese medicine are somewhat comparable to nadis. Nadis are the subtle channels along which the vital forces of prana flow. Out of the many nadis, fourteen are considered more important, and of these, three are the most important - ida, pingala and sushumna. Sushumna nadi runs within the spinal cord, from the base of the spine to the brow chakra and is silvery in colour. Chandra nadi emanates from the left side of the base chakra, passing through each chakra in turn in a curving path, finally ending on the left side of the brow chakra. Surya nadi emanates from the right side of the base chakra, passes in the opposite direction up to the right of the brow chakra. Chandra and Surya are the pathways of the two polar opposites of life force flowing within us. These currents operate alternately and the current that is flowing at any particular time is determined by the flow of breath in the nostrils. Ideally, the right nostril should be predominant during the daytime and the left at night. The impact of these currents on our physiology is directly related to the movement of both the sun and moon. When the right nostril (Surya) is active, then vital energy is more active for physical work, digesting food, etc. The mind is outward-focused and the body generates more heat. When the left nostril (Chandra) is active, the mind is introverted, and any kind of mental work that requires concentration can more easily be done. Chandra nadi flows more during sleep. When something is not right, such as an illness, a switch can occur. If Surya flows more at night, you will become restless and find it difficult to sleep. If Chandra flows when you are eating, the digestive process is affected, causing indigestion. All our activities are influenced by the flow of these nadis, which alternate approximately every one to two hours. It is possible, however, to alter the flow voluntarily by using willpower and certain yogic techniques. For example, if there is work to be done, but you feel sleepy, you can direct the flow of prana to the Surya nadi, gaining energy. This can be done by Surya Nadi pranayama. These two nadis appear to correspond to the two halves of the autonomic nervous system - the sympathetic and parasympathetic. 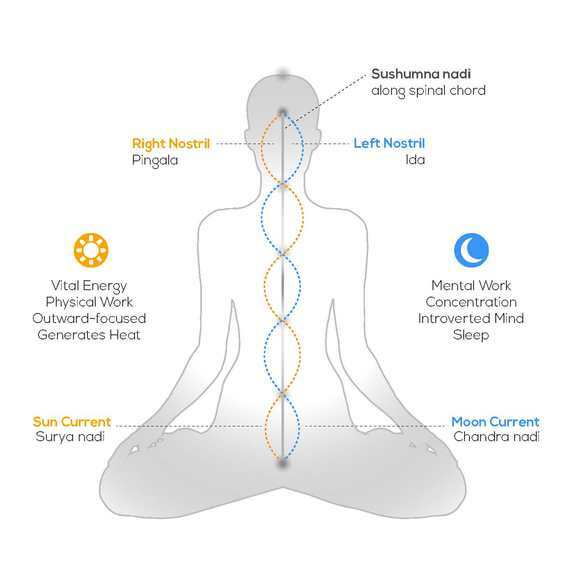 Surya coincides with the sympathetic nerves, which stimulate external activities. The parasympathetic nerves reduce the heartbeat, constrict the blood vessels, and slow the respiration so that the individual becomes introverted. The flow of prana in these two nadis is involuntary and unconscious unless yogic practices control it. So that is why in the olden days people would get up and examine their breathing. If it was not as it should be, they would drink some hot water and do things like pranayama, walking, etc. If you are very careful, just around sunrise and sunset you will witness a slow shift from right to left, or left to right. And if you happen to meditate at that time, your progress will go like a rocket, as it is just the right time. The Sushumna nadi is active and balance is there between your sympathetic and parasympathetic systems. When you go to sleep by 9 or 10 o'clock at night, observe the right nostril switch to the left. If you get sufficient amount of sleep, your right nostril will automatically be predominant first thing in the morning. Over millennia these systems have evolved in us and when the sun rises certain hormonal patterns are triggered. If you follow the rhythm, then your health will automatically improve. What happens if you stay up late at nights? When your strength and youthfulness start to decline, you will be swimming against the current and your decline in health will speak volumes. It is good to set a pattern early in life, in tune with Nature.